Skis, now there's a rather fundamental requirement in ski biking that we need to be using skis, but they come in so many varieties and forms that it is actually quite complicated to choose what type you actually need. For the moment lets discuss "blade" and "short ski" types for the moment. Blade skis are typically less than 1.0 metre in length, originally designed around the need for mountaineers to carry them up to the top of some peak, clip them onto their boot soles, and take the fast downhill route home using the last of the natural snow runs available. They had to be light, tough and quick to clip on as well as fun. The earliest forms I can remember were the "Big Foot" types of the early 80's, daft wide things with curves in all the wrong places, but never the less, did the job. NISM skibike skis - but what should we be looking for in a Blade type ski? However it soon became apparent that they could be used as on piste skis and a whole plethora of semi mini skis appeared, really short around 60cm’s. Now we regularly see the more useful 100cm mark and more recently, the emerging short skis at 120cm. More importantly though, they have become more ski than blade, proper release bindings, nicely curved edges that will hold carving turns, nice curved tails to allow tricks and stunts and composite construction, just like their larger cousins, to control flex and twist. One only has to look at the Solomon Crossmax 120cm and Atomic series of short skis, to see all the construction traits of a genuine on piste ski. Blade skis are certainly no longer the dead feeling lumps that we used to attach to our walking boots. OK so without buying specialist ski biking skis ( which are available ) what should we be looking for in a Blade ski. Well the honest answer is there is just too many variables for me to be able to "road test" all brands and variations, but I've built up enough mileage on the types I have tried on my bike that I think I can start to make some assumptions. I specifically tried the extremes to see what differences there are. OK then how do you pick a set of skis? The extremes were wide, short, small radius and long radius. What am I talking about. Well have a look at any ski specification and somewhere will be a series of numbers giving length, width of the ski at the widest front point, width at the mid point and width at the tail. Now join the dots by running an imaginary line through those points over the length of the ski and an arc is formed. The really really important bit is that arc when angled into the snow, forms the radius of your turn. So then a skis specs could be L99.9: SC 105 : 80 : 100 : R 6.0. ( that’s a Salomon “Snowblade” ) That arc will shorten as the ski has G force applied dependant on whether the ski is soft or hard and the applied force. Blades seem to be mostly in the "hard as planks" category to cope with a wide spectrum of skier weights. OK then how do I pick a set of skis, well that will depend on what your intended "usage" and your ability is. Do you mainly want to ski on pistes, more off piste perhaps, do you want to do ace hockey stops spraying snow over your mates followed by a 360 and a bit of backward skiing thrown in. Now throw into the equation your weight including your riding kit and your bike, your riding ability, your bike design, does it have suspension, there's just so many variables. Let's start with a relative novice looking to ride mainly piste ( lets be honest here guys and girls, you may think you spend more time off piste, but how do you get to that favourite off piste ) Look on line at a number of short ski sales sites ( www.theshortskishop.com are a good shop with lots of different blades ) and throw in your total weight to find the correct length, almost certainly you will be straight away 100cm metre or more. Now go to your bike and see if indeed two 100cm skis will fit without touching, using the axle points as the centre of each ski. If so now input your normal snow conditions, mainly groomed hard pack trails, back to the on line site and almost certainly it will be a relatively narrow waisted ski around 80mm at the centre of the bindings. Now comes the conundrum, what radius ski for a novice. I found that the shorter radius skis are much easier to skid off the edge allowing easy skid turns ( and that is what a novice skier does and is taught ) and good controlled stops, now that is really really important. So back on line and find a narrow waisted, small radius ski to match your weight. My Salomon “ Snowblade “ would be a pretty good all round ski at L99.9: SC 105 : 80 : 100 : R 6.0. for most beginner / intermediate skibiker. Equally a good ski biker on piste will choose a narrow ski ( allows a quick roll time edge to edge using the limited amount of loose snow to roll the ski over on ) but here's the difference, they would want to be carving nice radiused turns. Now using a bit of logic here, they also will be much faster over the ground creating a real problem for the ski. Try and do a 6.0m radius turn at 15mph and you can only imagine the G force created. The ski will quickly loose it's edge in the snow and begin to skid uncontrollably until the G force gets down to reasonable levels. So pick a ski with a longer radius. The wooden cored Gaspo Hot Stamp at 103-86-95 Radius: 10.9mts would be in this category. What radius ski for a novice? Mmmm controversial this one. A skier normally in off piste skiing would want a wide, soft ( more on hard v soft bending characteristics another day ) ski to float and support the weight of the skier, whilst allowing the ski to bend, ( forming an arc as side cut or radius is not going to work in powder snow ), to initiate the turn. Ski bikes in powder seem to be different, my experiences with a very wide pair of board style blades in fresh powder was disappointing to say the least. The Salomon SB10 at 128:106:122, ( radius I’m not sure as its not listed ) would be an example. The weight / drag of the snow over the tip, with the short length seemed to force the ski to rotate around the axle and seemed to want to dive the ski to such an extent that I seemed to be doing far too many over the handlebar dismounts that it became a problem. I had to have my weight so far back to counter this that it just felt wrong ( and if someone is thinking that's what they do when skiing off piste, then go and learn to ski off piste correctly ). Also that wide waist made piste skiing really ponderously slow to go edge to edge as there was insufficient loose snow beneath to roll the ski over on ( due to the wide waist ) and by consequence felt really “clunky” as you went through the middle of the turn. Not nice. Just to confirm my suspicions I changed to a much narrower ski with a reasonably wide tip and they seemed to work a treat. My gut unscientific thoughts are that ski bikes initiate the turn in powder by simply steering the ski and leaning the bike which a skiers knees cannot do, creating a natural "berm" deep down in the snow, with the rear ski now passing over the already compacted snow, creating the support that much wider and longer skis would normally be doing. It's only a theory and I'm sure many will disagree but it does seem ski bikes do behave differently in powder than a skier. . Now I know other manufacturers such as Lenz do like this wide style ski on their bikes so perhaps there is bike setup or even snow conditions between Euro and American mountains that maybe coming into play here. OK the snow park junkies, yep there's twin tip blades out there specifically built for the snow park, tough, built typically of a wooden core, strengthened edges, they are just for you. Downside they are heavy and due to the twin tip, have a much shorter contact area on the snow. Specialist ski for a specific need. OK so where have I got too on my bike, I looked at the 80cm I picked on eBay for a pittance, and put them aside, they just look wrong, too weedy for my 90kgs + bike and kit. Bought a pair of Solomon Snowblade’s and set to and learnt to ride. 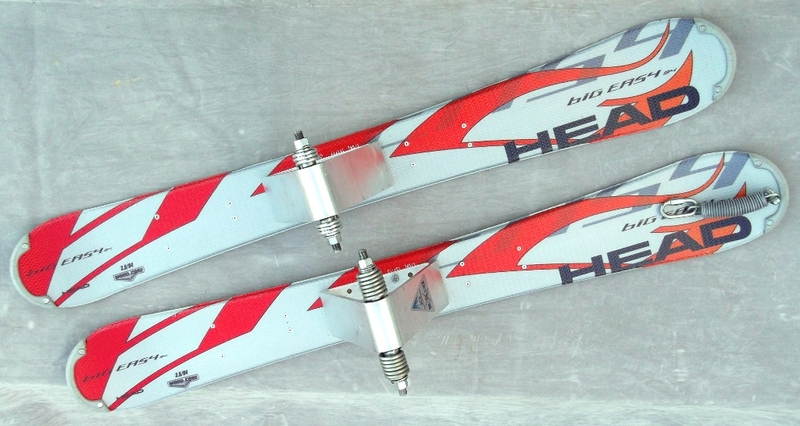 Then tried a pair of Solomon One|Ten’s as a powder ski, really disappointed, and put them too aside for the moment. Now trying Gaspo Hot Stamp 99 long radius blades, these seem really nice and hold quite a good edge, but I wouldn’t recommend them to start with, as they are quite hard to skid stop in a controlled way, preferring to arc the turn. What would I like to try next, a 80cm front and 120cm rear as I have this theory that particularly the peggers amongst us, put a lot more energy into the rear ski by the way we ski and as the rear ski is doing the majority of the work, needs to have a longer edge and snow contact area. Remember some time ago I mentioned that my bike has a 60 / 40 weight bias to the rear ski and most will have nearer 70 / 30, which should dictate a long and short ski to ensure equal weighting on both skis. I think also that the ski bob designs have headed in this direction. But it would mean real surgery to most bikes which would need the rear swing arm shortening to get that rear ski into the right position. So then if I was building a ski bike, what would I fit. Well eBay and other similar sites have some real bargain blades in the summer and spring, the most I have paid is £ 70.00 for an almost new Solomon blade which has been very good to learn on and surprisingly good as a powder ski. It's specs are L99.9: SC 105 : 80 : 100 : R 6.0. which puts it into that medium category, a good start. It's one downside is that it is not a wood core and thus one has to be “Uber” careful how you mount the adaptors and that will be my next chapter, ski mounts and your bike. And that is a really really thorny subject. Looking for parts to build a skibike? Or perhaps one ready to ride away? See our Parts For Sale page here. My inner skibiker was surprised to see a chairlift in the charming seaside town of Piriapolis, it wasn't in operation at the time, but I suddenly felt grounded to a more familiar world. It was surreal to be sitting in a tiny Internet cafe, with an ambient temperature of 75 degrees reading about all the many exploits of the skibikers in the Northern Hemisphere, such as; Raymond Georgsson's record breaking skibike jump attempt. Ironically since the end of the 2012 SkiBike Tour, there has been so much skibiking interest that, as I predicted, next year may indeed have to involve a tour bus and some serious chalet accommodation. For the first time in weeks I awoke late and to a bewildering selection of noises; noisy footsteps in the corridor, car tyres on wet tarmac, strangers voices, where am I now? Oh yes, France, no that's not French, Switzerland, perhaps? no not Swiss-German but getting closer. Ah that's it Swedish, I'm in Sweden and yesterday I was fighting with a recalcitrant T-Bar and riding a wonderful skibike in the centre of Stockholm with BikerMads. My flight is not till the late afternoon, I have the day off in Norrköping, confusingly pronounced Noy-shirpping in Swedish. All breakfasted and squeaky clean I took a stroll through this handsome industrial town, filled with impossibly cool and good looking Swedes, where do they hide all the ugly people? I feel 13 years old again, but trapped inside the body of a stranger, hang about, wasn't that was the plot of an episode of the TV series Quantum Leap or the Tom Hanks film "Big"? On this fine morning, I feel both the joy and novelty of youth and the the world weariness of Highlander the fictional 500 year old immortal. 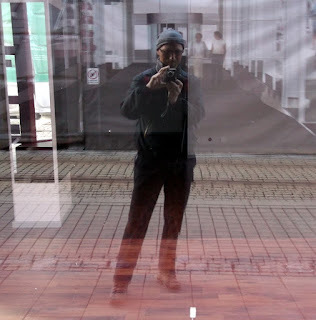 I catch my own reflection of this thin, tanned stranger in a shop window, dressed in slightly tatty winter clothes. So that must be me then and what an adventure this stranger has had over the last 2 months. Thanks to the encouragement of the stoic Carl Day in Flaine, France, I made the somewhat painful conversion from the world of the ski-bobber to that of the freestyle pegger skibiker, time for another faceplant Mark? Anyone need a pair of unused footskis? I can't see me ever using them again. Next, I became the most senior representative of the BullSkate SkiBiking fraternity in Sörenberg, Switzerland. Living in a Nuclear Bunker and hanging out with all the bad kids ruining their style and old enough to be their Grand Father. I would like to believe that some tiny, tiny, part of all that uber-coolness has rubbed off on me, I can definitely crash out with much more of the stunt man's loose limbed confidence than ever before. I then confidently returned to both the French Alps and French Jura mountains in freestyle skiber mode; boldly exploring some tiny ski stations that may have never been tracked by a freestyle skibike before. No doubt the next generation of skibiker will set new standards and show me what is truly possible on a mountain bike that rides on skis and without brakes. I happily re-united with Serge Mermillod, the very first person to sit me on a pegger skibike and teach me to keep my feet off the snow whilst riding. one year later we rode red runs together, on the pegs, at speed, in safety and style. Finally, I completed joining the dots in Europe, by meeting the genteel BikerMads team and seeing the future of skibiking in the Nordic countries start to gain momentum. I have so much confidence that the future of skibiking in Europe is positive. Every time I ride, people want to join the party, after all if the "old man" can do it, imagine what they could achieve. Each country will be slightly different though; the Swiss skibikers are moving towards aggressive and macho stunt riding, meanwhile the French are shaping skibiking into a form as soft and sensuous as the World's language of love and romance. How will the naiscent Swedish skibikers define the signature style of their skibiking passion? Will it be Raymond Georgesson making the highest or longest jump from a telemark ramp? In Britain, we have yet to see how we will compare to our European cousins, but remember my Continental chums that the British have always shown the way ahead in extreme winter sports. From posh gentry in the early 1900s riding on planks with a bamboo pole to one side and shunned by the local Alpine populace who stoned them with snow balls at each and every opportunity.... "God Save The Queen". Sno!Zone in Milton Keynes who, by allowing access to SkiBikes, have made it a year round passion. Mr Wayne Richards for the encouragement to "ditch the footskis", pre-season snow dome freestyle training and 100% accurate analysis of skibike design, skibiking dynamics and many hints, tips and wrinkles. The Olivier Wagner and AFSB, the French skibike club, for working so relentlessly over the years to re-introduce veloskis into France and to Richard Platt of SAGB, the British skibike club, for the schmoozing of all those recalcitrant Mayors in tiny French villages, the British Army's gain was the Diplomatic Service's loss. The Resorts of Flaine, Samoens and Les Carroz know collectively as "Le Grand Massif", you are leading the way and are now the nearest thing France has to Durango in Colorado. Perhaps next year Flaine will put skibikes on the same footing as SnowScoots. Mr Carl Day, the man with a laugh big enough to carry across whole mountainsides, maybe one day I will get to see the pictures. McDonalds restaurants who provided my sole reliable point of Internet access in Europe, all for the cost of a cup of coffee. Please add some more vegetarian items to your menu, fish is not a vegetable! The potato wedges were delicious though. Serge Mermillod, from Firem VS, for his companionship, fine wine and rides of the splendid pre-production version of the new VS512, I hope you sell lots in 2013. Martin Schwaiger from BullSkate for not clubbing me to death with a skibike saddle, due to my lack of almost any natural sporting ability and for helping me to reach dynamic equilibrium on the T-bars of Sorenberg. Frederic Hupka for the use of his nuclear bunker, may it never be used for its intended purpose and provide a temporary home for other skibikers keen to follow in my tracks. The many smaller ski stations of the French Alps and French Jura mountains for having the foresight to grant access to your ski lifts and slopes, helping out a pesky "RosBeef Anglais" in time of need, long may you continue. Especial thanks go to the unknown pisteur at Le Crozet who treated me to a brief and exhilarating 90 second ride back up the mountain on his snowmobile. To my sister Colette for the use of her personal space as a skibiker crash pad and soggy boots and gloves drying out room. It was cleaner when I left, honestly. To the BikerMads team for accepting an eccentric Englishman into their tribe, letting me abuse their prized skibikes on the T-bar, running over rocks and ice willy nilly and for taking the time out to show me the town and make me feel genuinely welcome. Now don't go mixing any Coca Cola with the Scotch, I will hear its cry all the way from England. And lastly.... to the readers of the SkiBiker SkiBike Blog who have stopped lurking in the background and decided to contact me, you know who you are. I have the feeling that the 2013 SkiBiker Tour will be a somewhat bigger affair and there could be some new SkiBiker writers adding their voice and opinions to the SkiBiker SkiBike Blog before then. If you would like to join the skibiker party, please contact me through the FaceBook links provided or through SkiBiker.org the more the merrier.